Indian knotgrass or commonly called as Madımak in Turkey,which is a kind of weedy creeping herb, that generally has woody stem and seen at spring. 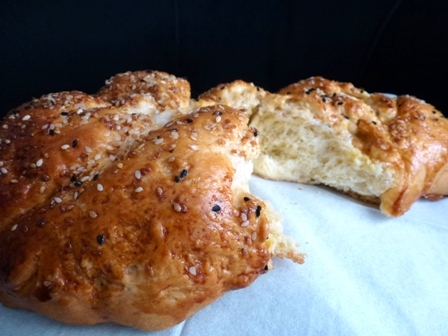 It is a sine qua non for the Sıvas city cuisine, grows also in the central Anatolia region. According to Journal of the Science of Food and Agriculture, it contains antioxidant. 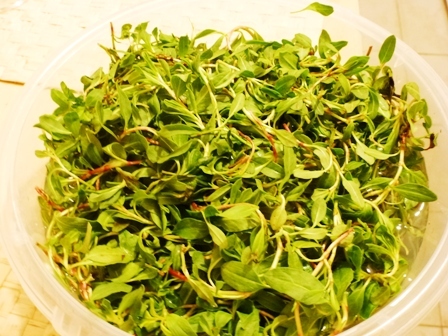 I found this local herb at my neigbourhood market and bought it as a dedicated market shopper. 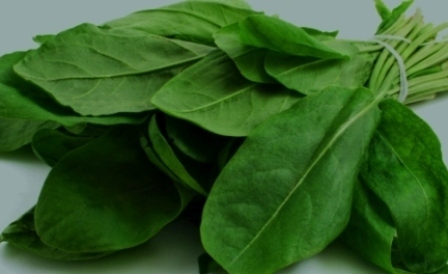 According to me, with hard leaves the raw Madımak has no taste, but when boiled has a rather similar taste with spinach. 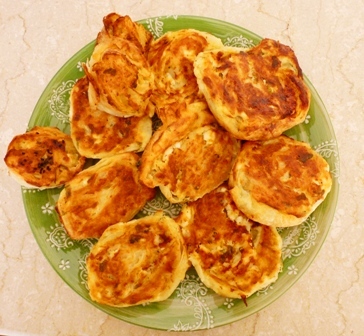 In Anatolian villages, generally served with omelet or a soup dish. Sometimes dried and stored for winter. Cut the woody stems off and soak the Madımak wash them for several minutes to loosen any specks of dirt. Drain them. Place them in a stockpot. Cover with water. Boil for 5-8 minutes. Shake and drain in order to remove any excess water. Place the grated onion in a skillet with extra virgin olive oil. Sauté the onion until it begins to purple brown. In a bowl,stir white cheese and egg and combine with Madımak. Lay a sheet of filo on the counter top. Brush with olive oil and fold in half lengthwise. Place Madımak mixture and start rolling from bottom to top. Brush with some olive oil. Repeat the same with the other filo. Place them to parchment paper covered tray. Cut it in 4 cm thickness pieces. Repeat the same for the other filo. Brush top with egg yolk. Sprinkle with nigella seeds and sesame seeds. Optionally, refrigerate overnight or you can assemble the pastry a couple of hours ahead of time and chill it until you are ready to bake. Bake in 190° C pre-heat oven about 25 minutes until golden brown. Combine yeast cube into luke warm milk. Stir 1 t sugar and let it stand to proof until bubbly and doubled in volume, about 10 minutes. Mix butter, olive oil, the rest of the sugar and eggs, beat well. Add flour, the rest of the milk, mastic powder, mahlab powder, a pinch of salt to the egg mixture. Finally add the yeast and knead well. Make a soft dough. Dough will stick to the bowl, but should not stick to your fingers. If you are kneading by hand; turn out onto a well-floured surface and knead about 10 minutes by using only enough flour necessary to prevent sticking to your hands. Transfer the dough to a large bowl. Cover with a tea towel and let rise in a warm place, about 2 hours or until double in volume. Cut dough into 12 equal pieces. You can weight each piece of dough to have equal piece of dough. Make 20 cm long strips from doughs and put together 4 of them to make a braid. 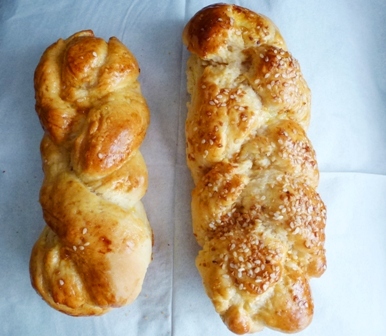 Place each braid in a buttered or parchment paper covered baking tray. Allow them to rise for 30 minutes. Beat together 1 egg yolk with 1 t milk. Generously brush the top and sides of the bread with the egg mix just before baking. Bake them in 190° C pre-heat oven until golden brown for about 20- 30 minutes. Sorrel is a leafy green vegetable that is native to Europe. It has a sharp and lemony taste. It gets its sour taste due to the presence of oxalic acid. Its name is derived from a french word, that means ‘sour’. 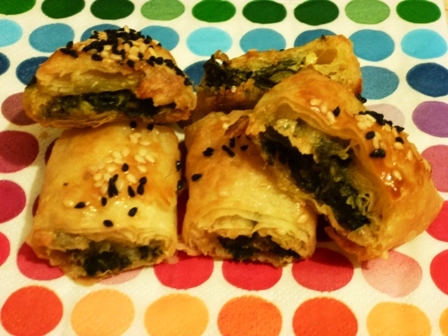 Because of its bitter flavour, I was combining sorrel with spinach and/or other vegetables while making this filo pastry. This time I used only sorrel and the result was delicious. Wash and dry the sorrel. Just grab a handful and roll it together. Run the knife through the length of the roll of sorrel and cut. Mix cheese, egg and walnut to sorrel preparation. Season with salt and pepper. 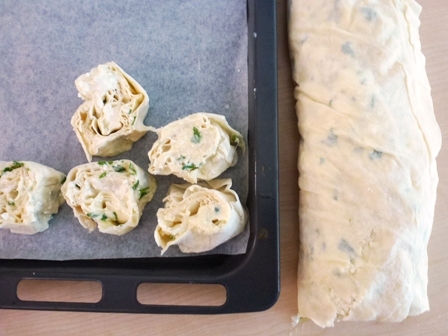 Place sorrel+cheese preparation and start rolling from bottom to top. Repeat the same with the other filo. Place them to parchment paper covered tray. Crumble white cheese and mix with chopped parsley. Add an egg and make a batter. 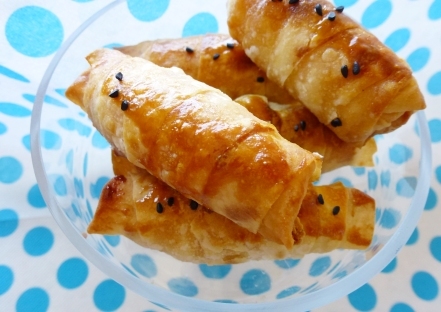 Brush a sheet of filo pastry with olive oil-yogurt mix. Sprinkle the 1/2 filling over the sheet. Place the second filo over it, brush with olive oil and yogurt mix. Sprinkle the remaining filling mixture. Fold in both long sides then roll up, starting at one of the short sides to make log. Brush the cylinder with olive oil. Cut the long cylinder into approximately 10 cm pieces. Sprinkle with nigella seeds (if necessary) and brush with the remaining oil. Place into a parchment covered oven tray. Bake in 200° C preheated oven for 25-30 minutes until golden brown. You can place the pieces in resealable freezer plastic bags to freeze up to three months. Every time, remove the desired number of pieces from the freezer, thaw and bake. A very crispy appetizer with vinegar! Cut strips of filo pastry about 4cm wide to 10 pieces. Mix the fluid stuff. Brush each piece of pastry with this mixture. Place the mixture to the brushed pastry at one end. Roll up like a cigarette, first folding in the edges so the filling doesn’t drop out. 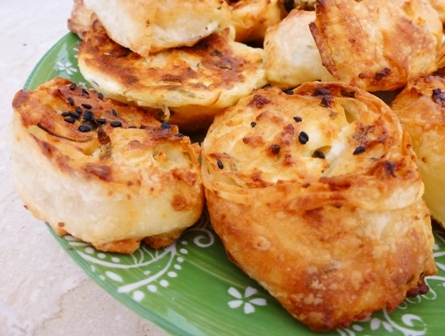 Brush top of each börek with egg yolk. 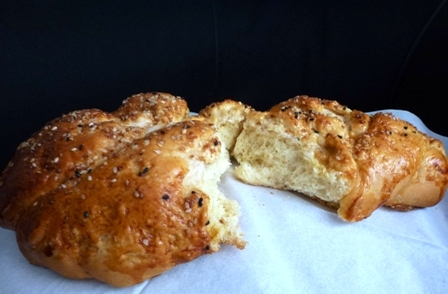 Place the böreks to a tray, covered with parchment paper. 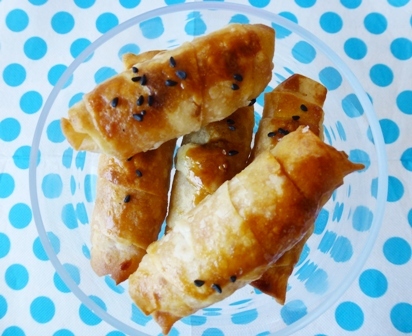 Spread nigella seeds to each börek. Bake in 200° C pre-heat oven until golden brown. 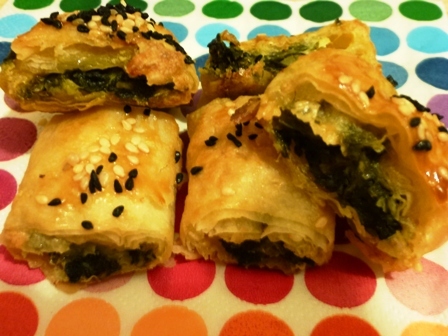 You are currently browsing the pastry&börek category at Aegeaneating.